A recent study by ComPsych of 17,000 organizations worldwide, covering over 45 million people, has revealed large levels of burnout within the workforce, which has implications for both HR and Recruiters. Why? 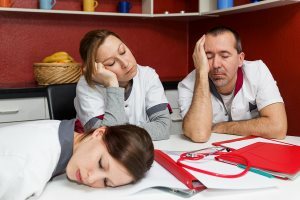 Because an organization with high and clearly visible levels of burnout will start to face retention issues, which will eventually impact recruiters who will face the uncomfortable challenge of having to find quality candidates in a tight labor who are willing to join an environment containing high levels of worker fatigue and psychological burnout. So, what is the extent of the burnout problem in the modern workplace? Well, it seems to be very significant. For starters, the study found that 36 percent of employees lose at least an hour a day at work due to stress, and 30 percent of employees come to work when they are too stressed to be effective for at least five days of the year. Rather worryingly, 63 percent of those surveyed are experiencing high stress, extreme fatigue and feeling out of control, and 39 percent cite workload as the top cause of stress. It is not surprising that we are facing such high levels of burnout in our employee population when we consider the impacts of the global financial crisis and increased competition from emerging markets. We have seen massive restructuring and downsizing of workforces, which has created sustained and intense pressure on workers in terms of increased workload. This has been occurring for such a sustained period that it is contributing to large degrees of burnout. But, what should organizations do about it? Certainly, organizations should be looking to prevent, eliminate and treat burnout, otherwise it will damage their employer brand, making it harder to both retain and attract top talent. And the starting point for addressing burnout is looking for the signs of it within your business. We are not looking for signs of meltdown, as these are obvious, but we are looking at some of the less obvious and unusual early signs of burnout, which the organization can spot and take remedial before full scale meltdowns occur. The ComPsych findings revealed 3 early signs of burnout. 1. Lots of coffee, cigarette breaks and chatting. The survey found that the most frequent coping strategy for stress cited by 53 percent of respondents was to take frequent “stress breaks” at work to talk with others. If you are finding a surge in water cooler chat, after work drinking, tea breaks, impromptu meetings, etc., you could be seeing a rise in stress breaks, which could be an early warning sign of a systemic burnout issue. 2. Productivity drop. Seventy-seven percent of those surveyed cite that reductions in productivity are one of the key impacts of stress. Have you noticed a decline in productivity or quality across the business or within certain departments? Look for trends. 3. Drop in attendance levels. All employees surveyed take at least one day off a year due to stress with 29 percent taking 3-6 days per year due to stress and 16 percent taking more than six days a year. There is a clear link between sick days taken and stress. Therefore, falling attendance levels are perhaps the best barometer and early warning sign that you may have of organizational burnout.